I'm going to tell you to do something I think you all know in your hearts that you should do - "post the pictures you love". It sounds almost fatuous but it's harder to stick to than you might think. For example, I was lucky enough to attend a workshop with Welshot Imaging last weekend - normally I'm teaching workshops for Welshot so it's nice to attend one for a change and the teacher, Adrian Wilson, was excellent. 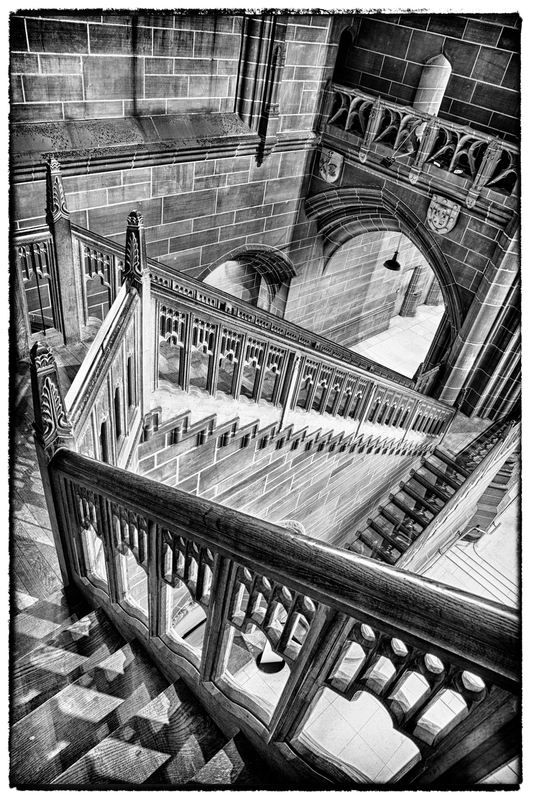 We were there to learn about HDR photography and we'd made arrangements to visit Liverpool Cathedral for a few hours to shoot some material to process later. I have a twisted streak that likes to subvert things so I'd been wondering how I could do something using HDR that didn't fit the stereotype of how HDRs usually look. I settled on two ideas and shot for them all day - black and white HDR and shallow depth of field HDR. I'm pretty happy with the results and you can see my complete collection of images from that day on Google+ and 500px but that's not what this article is about. I want to talk about selecting which images to show. I've been posting the pictures one by one over a few days after spending some time with each and deciding if I really like it enough to post it. I came to the picture you see above of the staircase and I very nearly didn't post it. You see I'd been shooting HDRs inside a beautiful old cathedral all day surrounded by amazing stonework detail, high ceilings and stained glass windows. And this picture I was considering was just a wooden staircase - and a fairly modern one at that. I imagined that people would think the staircase mundane and out of place. So I vacillated for a while and eventually decided to post it. And to my surprise it gathered the most comments of any picture in the collection (on 500px). Find a picture you love but didn't post because you thought others might not appreciate it. Now post that sucker!